Brush wonton squares on one side with oil and press into a mini muffin cups, oiled side down. Bake wonton cups for about 10 mins, or until golden brown. Cool completely in tins. Blend mayonnaise, cilantro, lime juice, chutney and dip mix in a bowl. Stir in the chicken. Season with salt and pepper. 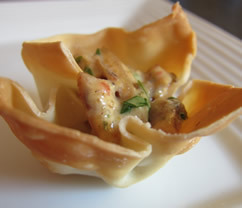 Spoon 1 tsp salad mixture into the wonton cups and serve.